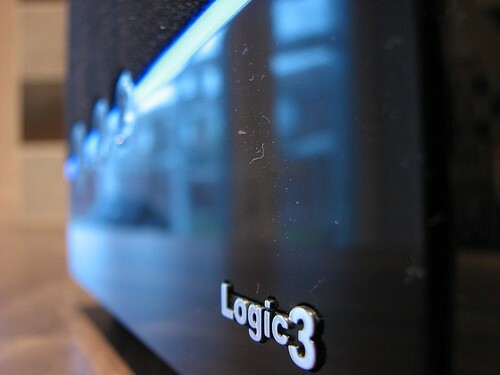 For the ultimate party sound system, look no further than the Logic3 JiveBox. This all-in-one cube design houses a 2.1 speaker set up capable of delivering a surprising amount of volume for such a compact system. The JiveBox comes complete with IR remote, 3.5mm line in cable, AC adapter and an assortment of docking cradle plates to fit various iPod sizes new and old. 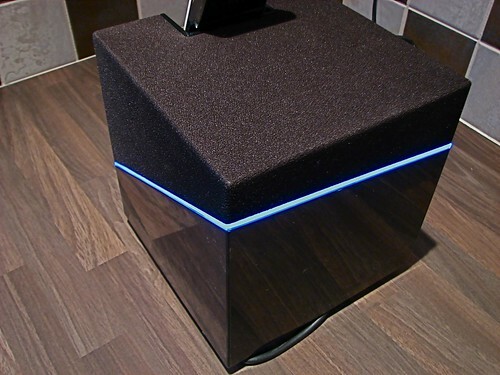 The focal point for the JiveBox has to be the seven inch glossy black design that encases all of the speakers and neatly hides the cables away underneath the unit. Its simple design is complemented by a glowing strip of light that can be changed between the three colours of red, blue and green. The 2.1 speaker system actually consists of five speakers. Built with two 75mm drivers, 25mm tweeters and a 130mm subwoofer there is definitely no shortage of audio channels to output your tunes. 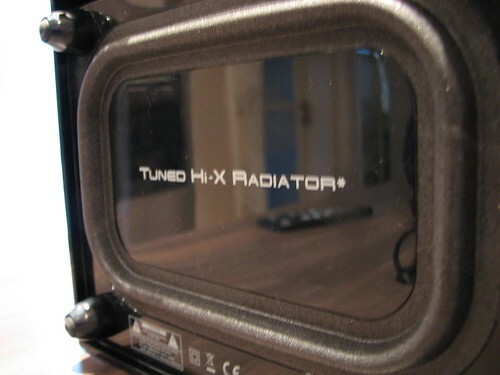 The subwoofer is connected to the massive radiator that takes up the most of the underneath of the cube. What is most impressive about the JiveBox is the amount of noise it can generate from what is just a small cube. Crank up the volume and you get distortion-free music that delivers clear vocals, enough for casual listening or when it’s time to party. Bass levels are equally impressive and with the right track and the bass on full setting, you can easily get some floor vibrations out of the JiveBox. 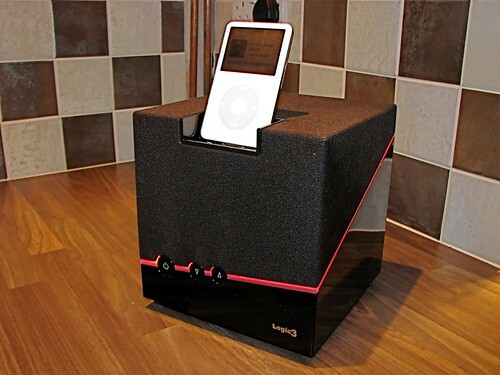 It can achieve this without outputting any distortion, which is a testament to the speaker engineering and technology that has gone in to making this iPod speaker dock possible. The slim line remote gives you control over the usual set of playback functions such as volume and skipping. Since the JiveBox unit has been designed to be simplistic and true to its cube form factor, there are fewer control buttons. 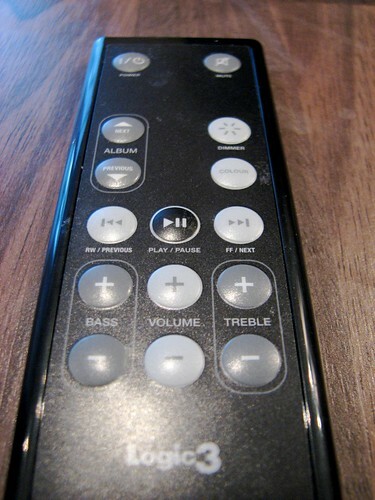 The remote gives you album skipping, bass and treble control and the ability to change the colour of the light on the JiveBox as well as the intensity of the light through the ‘dimmer’ button. Only minor issues stop the JiveBox from being a perfect system. As with all glossy black products, they inevitably end up showing up dust, fingerprints and surface scratches. These are unavoidable unfortunately but I guess that’s the price you have to pay for design. What would have been nice is to have seen this fitted with an aluminium exterior. Logic3 have taken a different stance on the JiveBox and it’s definitely a step in the right direction because they’ve managed to create a speaker system that isn’t just well designed on the surface, it’s also got a lot of speaker technology so the sound quality is on par with the design. What is this cube “coffin”? Personally wouldn’t buy because of unaesthetic design.